President Trump described a handful of grisly murders allegedly committed by undocumented immigrants to make his case for building a southern border wall during his first prime-time address from the Oval Office Tuesday. Among the examples, Trump described the Dec. 26 shooting death of Newman police Officer Ronil Singh, near Modesto. "America's heart broke the day after Christmas when a young police officer in California was savagely murdered in cold blood by an illegal alien who just came across the border," Trump said during his speech. "Day after day, precious lives are cut short by those who have violated our borders." 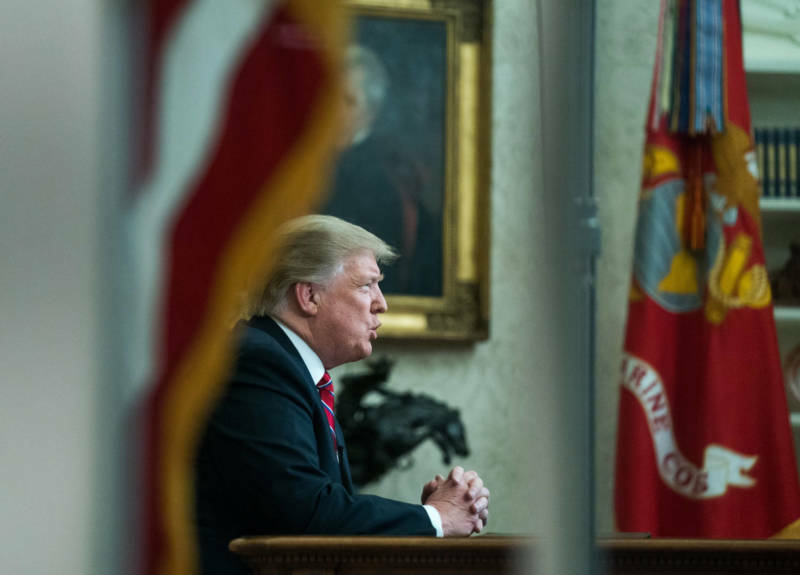 Trump's repeated demand for $5.7 billion to construct a barrier he called "absolutely critical to border security" comes as the government's partial shutdown enters its third week, and remains the key sticking point with Democrats. Bill Hing, a law professor at the University of San Francisco, believes the president emphasized "horror stories" to scare Americans into backing the physical barrier. "Making it seem like every undocumented immigrant who comes to the United States is going to commit a crime. That's so misleading," said Hing, who directs the Immigration and Deportation Defense Clinic at USF. "To me, that's the equivalent of hate-mongering and basically engaging in racism." Most unauthorized immigrants trying to cross the border don’t have a prior criminal conviction, according to figures from U.S. Customs and Border Protection. Out of nearly 304,000 arrests by border patrol agents in fiscal year 2017, only 3 percent had a prior criminal conviction in the U.S. or abroad, and most of those criminal offenses were nonviolent, such as entering the U.S. without the necessary documents or driving under the influence, agency data shows. Several studies have shown that immigrants are less likely to commit serious crimes than people born in the U.S., according to the American Immigration Council. John Eastman, a professor of law and community service at Chapman University in Orange County, defended the president's use of the gory murder cases, saying Trump was only "highlighting what's going on." "Those are crimes that ought not to be committed because the people ought not to be here," Eastman said. He believes greater border security, including a wall or steel barrier, would prevent violent crimes by significantly reducing all illegal immigration. "It's common sense. It's harder to illegally cross the border when there's a physical barrier in your way," he said. Hing said the president's plan to build a wall was "shortsighted and superficial," and that it failed to recognize the main reasons people seek to come to the U.S.
"Building a wall will not stop people if they are desperate, if they are fleeing persecution, or even if they are trying to feed their family," Hing said. "Trying to understand why people are coming, that's the answer." Unauthorized border crossings have consistently fallen since 2000, from a record of 1.6 million arrests to 400,000 in 2018. Immigration experts say a big reason for the drop is that fewer Mexican nationals are attempting to cross into the U.S. without papers, as that country's middle class and economic opportunities grow. The number of apprehended families with children and unaccompanied minors from Central America continues to grow. Border patrol agents arrested more than 107,000 family units — which the agency describes as at least one parent and one child — along the border with Mexico in fiscal year 2018. Five years ago, just 14,800 were arrested. Those migrants often say they fled violence and repression in their home countries.